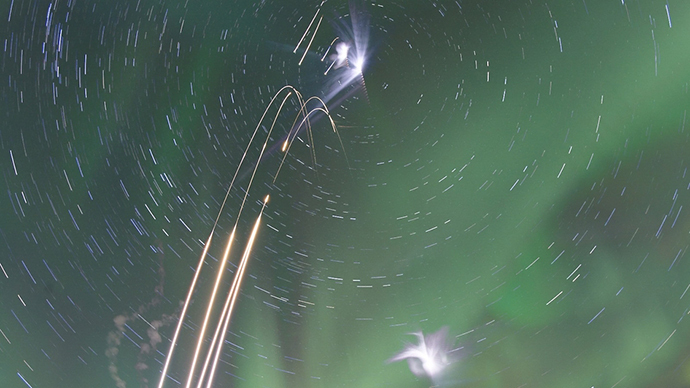 A NASA astronaut on board the ISS has recently been busy snapping the Northern Lights in various locations around the globe. Be it at sunrise over the US coast, or in the dead of night above central Russia, the images are stunning. Barry “Butch” Wilmore, US astronaut on the International Space Station, also managed to capture the lights of Aurora Borealis dancing dazzlingly over central Russia’s snowy landscape between Moscow and St. Petersburg. Earlier this week, NASA revealed an incredible video clip that shows how the sun rising over the northeast coast of the US as it met the polar light show. Wilmore made the video over Virginia, Delaware, New Jersey, New York and Massachusetts, and it was posted with a caption: “All we need now are angels singing”. Aurora Borealis, or the Northern Lights, is nature’s spectacular show usually seen in the skies near the magnetic poles, in the Arctic and Antarctic regions. Its dancing lights are an effect of particles from the sun triggering reactions in the Earth’s upper atmosphere, when photons of light are released by oxygen and nitrogen molecules. The International Space Station, which can be partly seen on the video, captured by NASA, is currently home to six astronauts, three Russians among them.